Kastar flat ratcheting box wrench sets come with wrenches that can get to those ''hard-to-get-at'' nuts and bolts. These wrench sets come in a vinyl pouch for easy storage. Flat ratcheting box wrenches from Kastar are well known for their long life, ease of use, quality and accuracy. 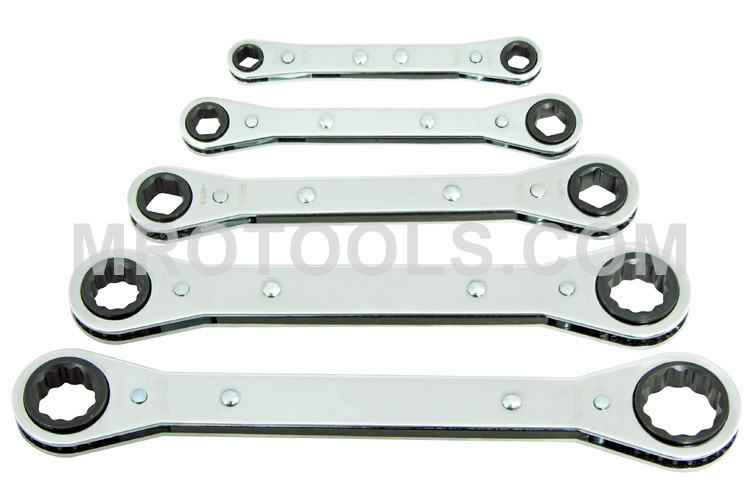 Kastar flat ratcheting box wrench handles are nickel-chrome plated for lasting quality and assurance. All Kastar ratcheting box wrenches utilize the ''torque grip system''. Openings are accurately broached for that perfect non-slip fit and critical parts are heat-treated to ensure safety and durability. The RBM-5 Kastar 5 Piece Flat Wrench Set, Metric is one of thousands of quality tooling products available from MRO Tools. 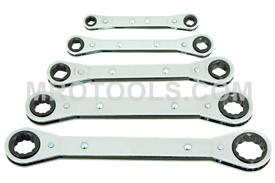 Please browse Kastar Ratcheting Box Wrench Sets for tools similar to the RBM-5 Kastar 5 Piece Flat Wrench Set, Metric. RBM-5 Kastar 5 Piece Flat Wrench Set, Metric description summary: Kastar 5 Piece Flat Wrench Set, Metric. Part Numbers: RBM-0708, RBM-0910, RBM-1113, RBM-1214, RBM-1517 Socket Sizes: 7mm x 8mm, 9mm x 10mm, 11mm x 13mm, 12mm x 14mm, 15mm x 17mm Point Size: 6, 12 Quantity discounts may be available for the RBM-5 Kastar 5 Piece Flat Wrench Set, Metric. Please contact MRO Tools for details.